If I were a witch my familiar would be an owl. 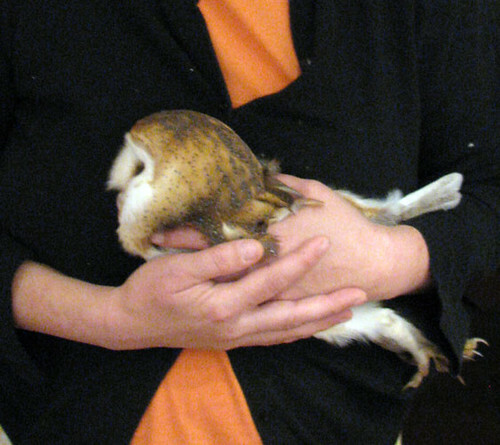 In my life I've been lucky enough to find three owls (two Barn Owls and one Burrowing Owl) who all needed a little helping hand — the last one was last night in our hallway. I think it flew down the chimney. It was a Harry Potter-ish kind of night. I caught him in an alcove, now to be renamed the owl-cove. 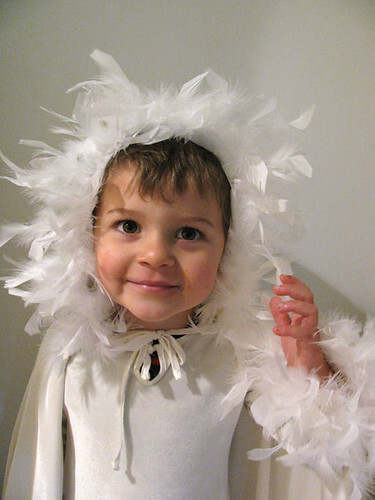 Feathers of a different sort — a Dora Snow Princess dress from Santa — as requested. Here he is as an owl many moons ago. And, if you ever get a chance you should read Owls in the Family by Farley Mowatt. I hope my next owl encounter is a fledgling that needs a good home. That's amazing that the owl will let you hold 'it' like that! Read that book as a kid... great book! For wee kids... Owl Babies was a fave at our house! I collect owls myself, and my daughter (who is a little over one year old) was an owl for Halloween. Hopefully, I'll be able to help an owl myself someday. How amazing to find an OWL in your hallway....will check out that book for my kiddo, thanks! "If I were a witch my familiar would be an owl." Exactly for me too! Send me your snail mail when you get a chance by email. I did another night owl woodcut for the holiday. I'd love to send you a print. I skipped doing one the previous year, but managed to do it this year. I'm happy you are still blogging! Great to read your posts! Happy 2010! I love your owls! I was awake for quite a long time last night with a sick child but the treat was that there was an owl hooting in our backyard last night which so rarely happens. I was happy to hear him. Oh! I want and owl in my hallway!! What beautiful feathered friends you have. We have some great horned, which I hear a lot. BTW, great horned owl puberty is hard to endure. Very noisy and hilarious with the cracking voice.